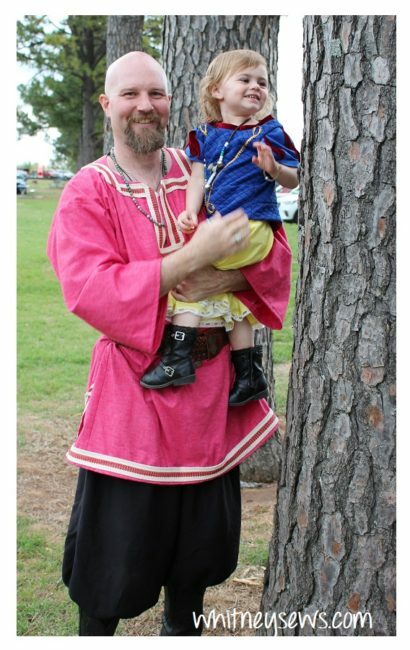 Last month Jeremiah and I went to our local Medieval Faire and had a blast! We are the kind of people who can’t just attend a faire or festival…we are the kind who go all out and dress for the occasion. This year Jeremiah requested a viking style costume for the event (there is a viking festival in Oklahoma we are considering attending later this year). So I pulled from my stash and made his a costume. The red material is a bleached muslin fabric I thrifted (14 yards for $3.50!) then Jeremiah hand dyed it. We were planning on using it for a different costume, but we measured wrong and didn’t dye enough of it. However it worked out perfectly for this costume! The pants were made from an old black sheet. Check out the video HERE to see how I created the tunic and pants! Doesn’t Peyton look adorable in her Snow White costume?!? Click HERE to see how it was made! Skyler wore the green dress I made two years ago for Peyton. HERE is a video about that dress! I made a super simple dress for myself to wear with a purple Damsel in this Dress corset. I also made leather Celtic inspired shoes that I wore to the faire! I will have a separate video coming soon showing how I made the shoes. Since going to the Medieval Faire we also made a trip to Sea World! My dad took the entire family and we had a great time! We got to try out our new vlogging camera and its waterproof case while at the park. Check out the vacation video HERE! That video is actually on my new channel that I just launched called Whitney’s Tiny Life. There have been lots of things I’ve wanted to film/share lately that doesn’t really fit into my Whitney Sews channel so I decided to start a separate channel for family videos, vlogs, etc. If you’re interested in any of that make sure to subscribe to Whitney’s Tiny Life! Well, I think that is everything for this week! Make sure to come back next Wednesday for another new video. Until then, Happy Sewing! 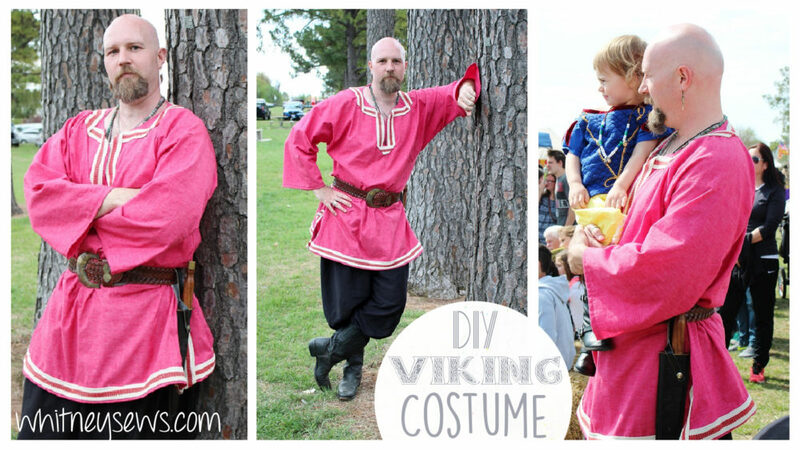 This entry was posted in Blog and tagged Cosplay, Costume, Medieval Faire, Viking.